This adventure has the makings of a neat day-trip, so pack a lunch, your camera, take your time and enjoy. 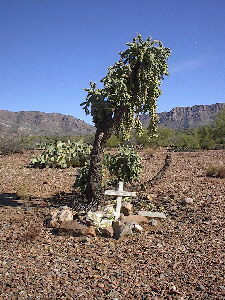 Mattie Earp, born Cecilia Ann Blalock in Wisconsin in 1850 [according to her grave marker], ended her life in Pinal City, Arizona - now a ghost town outside of Superior, Arizona. She was buried in a now-obscure cemetery on the outskirts of the mining town that existed then. Surprisingly, there are a number of the original gravesites surviving the passage of years with, nearby, a few newer additions - notably a poetic memorial to "Wolfgang, a dog". 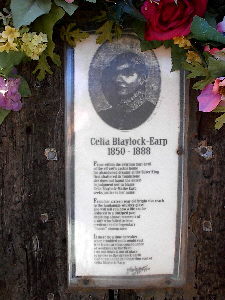 The gravesite of Cecilia 'Mattie' Earp is clearly marked and well tended by local historians and interested visitors. 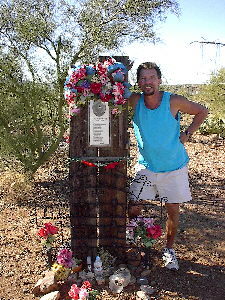 When we found her grave on Christmas day, 2006, we left a string of green tinsel with red poinsettias on the marker, just below the memorial poem. First, a bit of questionable [?] history about Mattie: Records indicate she apparently took up with Wyatt Earp some time around 1871 in Fort Scott, Kansas, shortly after the death of his first wife. When Wyatt and his brothers headed west in 1874, Mattie accompanied them through all their escapades involving gambling and prostitution. Eventually, the group arrived in Tombstone, Arizona, where an 1880 census lists Mattie Earp, age 23, as Wyatt's common law wife. If these figures were correct, she would be only 14 years old when she first met Wyatt. Ya gotta figure she was engaging in a bit of fibbing about her age on the 1880 census, doncha? At this time, she was probably closer to 30 years old. But who says her grave marker is correct either? Your guess. The wild life they were leading finally resulted in Mattie's addiction to alcohol and laudanum. To make matters worse, she finally lost her man to a dancehall girl who was living in Tombstone with another man. [Oh those Earp boys!] The rival's name was Josephine, and Wyatt inevitably left Mattie for the 'other' woman who lived with Wyatt for the remainder of his life. Following the legendary shootout at the OK Corral, Mattie and the Earp boys headed to California where Wyatt finally ditched her for Josie. Mattie eventually drifted back to Arizona, settling in the mining town of Pinal City, where she worked in her accustomed profession as a saloon girl with a little prostitution on the side. She died on July 3rd, 1888 - from an overdose of whiskey and laudanum - still a young woman. It's curious that her gravesite has survived more than a hundred and eighteen years in such a remote location when the woman, herself, died in such obscurity. Hmmmm. Well, in any case, the gravesite is clearly denoted as belonging to 'Celia Ann Blaylock - Mattie Earp' and, as such, makes finding it an interesting adventure. If you decide to venture forth to discover the site for yourself, here are the directions for getting there: Take Highway 60 east from Phoenix almost to Superior. You'll be driving past The Boyce Thompson Arboretum, which is in itself a wonderfully informative visit .... plan to stop if you have the time. Just before the Superior city limits you will find, on the north side of the highway, the Silver King road. Turn left onto this road and drive for about .7 miles [that's seven tenths of a mile - if you missed the decimal point there!]. You'll make another left onto Forest Service Road #8. These roads are best travelled in high-clearance vehicles as ruts, rocks, washouts and bumps are the norm. Approximately .4 miles [that's point four, pardner] from the junction of Silver King Road and FR #8 you'll see some well-travelled roadways going off this road both north and south. Take the second one on the left [we left a rock trail marker to point the way, but it may not still be there when you go.] Proceed along this track for about .8 miles and you should end up right at the cemetery - if you don't get sidetracked by the many intersecting roadways. Here's a clue .... you'll drive under one of two power lines to get to the site. The most obvious power line follows FR #8. You won't see the second line until you are close to the cemetery. Take pictures and a gift for Mattie, if you like; but please respect the sanctity of the place and leave the site undisturbed. Coming soon: Notes on 'ancient' wagon tracks petrified into the soil, and on Geocaching - a popular new 'hide & seek' game for the outdoors-minded.